Below are the complete details of the Manager Finance jobs in Foundation University in Islamabad. 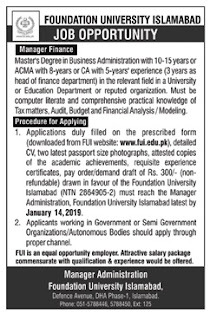 Qualification: Required Qualification: Masters degree holders Required Experience Must have relevant of working experience in similar job role & Interested candidates send your cv Manager Finance jobs in Foundation University Islamabad, in Pakistan published on Paperpk.com from newspaper on January 08,2019. Job seekers who are already working as can also apply for post of Manager Finance.